After a long, cold winter nothing feels better than getting out into the warmth and sunshine that heralds the coming of spring and summer. The sun is one of the natural sources for vitamin D, which is essential to the healthy functioning of our bodies. However, one of the hazards of enjoying pleasant weather can be sunburn, when your skin becomes red, irritated or even blistered when exposed to too much sun. Even when using sunblock, you may find your skin burning, especially if you have fair skin. Sunburn is the outward sign of cells that have been damaged by the UV radiation that comes from the sun. Skin becomes dry as oil production is reduced, and the cells become swollen with fluid to try in response. Too much sun can cause damage to the skin cells over time and may appear as premature aging with wrinkles and brown spots on your skin. When it comes to selecting essential oils for treating any kind of skin ailment, including scrapes, cuts, insect bates and burns, lavender is usually the first on many lists. It is a mild oil, where most people can apply the oil directly to their skin and has very few side effects. Lavender is a proven anti-inflammatory, which aids in reducing the redness associated with a burn. Inflammation may also lead to gathering of fluid in the cells so application of lavender may prevent blisters from forming. 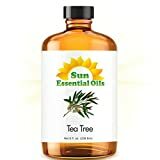 It can also be useful in reducing pain associated with sunburn not only by reducing the redness but also blocking some of the pain signals to the brain. Like many essential oils, lavender is also an antioxidant and may help prevent cellular damage caused by the overexposure to UV radiation. This may prevent further skin damage in the future. Peppermint oil is usually associated with products for oral health such as toothpaste and mouthwash. It is known for its effects on the digestive system: reducing gas and soothing the muscles of the stomach. When applied to the skin, peppermint gives a cooling sensation, which can be a relief to hot, enflamed skin. It is also a topical analgesic so it can numb pain after application. Antioxidant constituents may not only prevent damage caused by UV exposure but may also speed the healing process. It is these properties that make it ideal for not only treating the pain of sunburns but muscle aches as well. Peppermint oil has been used to relieve headaches as well as muscle pains. Many people may suffer from a heat-related headache after getting a sunburn and from being out in the heat for prolonged periods. Peppermint may help. Chamomile is another versatile essential oil that is good for issues dealing with the skin as it is mild in scent and has almost no side effects with use. It has long been used for its proven ability to relieve anxiety. Like many oils, chamomile is anti-inflammatory and antioxidant. It can reduce the redness associated with sunburn, which, in turn, reduces the pain and sensitivity from the irritated skin. It may also help reduce any potential fluid buildup, preventing blisters. It may even prevent and repair some of the cellular damage caused by radiation from the sun. Tea tree oil can be found in a lot of over the counter products that have to do with caring for your skin and hair naturally. It has been used by Australian aborigines for centuries to heal wounds and prevent infections, particularly those involving the skin. It has been proven to reduce swelling and redness. This may help manage the pain caused by overheated nerves in the skin. It can also promote healing and may help you recover faster. Tea tree may also be useful if you happen to develop blisters. The body becomes especially prone to certain infections after being burned, either by the sun or other methods. Being antibiotic, it can help prevent the blisters from becoming infected. Geranium is one of the many oils that are good for your skin and may promote healing after overexposure to the sun. Burned skin can be over dry and it may take time for natural oil production to recover. Geranium has been used to regulate sebum production and is also useful in reducing redness and inflammation so that you can recover more quickly. It is also an antioxidant, helping the body to naturally defend against radiation and the damage that is done to cells with overexposure to UV. This can be particularly helpful if the body’s natural defenses are damaged by repeated overexposure to UV radiation. In this modern age of understanding how certain environmental factors affect our body, essential oils are beginning to play and larger, more prominent role. These oils are not only all natural but they have been studied for their abilities to work. These oils can even work together to help you heal from the burn site. Though out bodies require vitamin D and the sun is a universal way to produce it, it is not recommended to allow your skin to burn repeatedly. This may be linked to the formation of certain cancers and premature aging of the skin. Using sunblock before burning is the ideal way to protect your body.